"I was amazed by the depth and the quality of his thinking... I can't recall the last time I saw something explained so well, and backed up by such clarity of thought." "I am fascinated with it... I pick it up often and just dive into wherever I open the book, and there is some fascinating reading here. Fabulous." "The work is not only a complete act, but a unique perspective in audience control, pacing, and staging. I was riveted." "I was fascinated by the intriguing and well thought-out writing style. Wonderful stuff. Can't wait for your future endeavors." "This wonderful book not only explains 'how' to present a very strong impromptu-looking demonstration, it also explains 'why' each specific movement or sentence is critical to the overall effect... Many wonderful ideas." "A very detailed and informative thesis on the combined presentations of magic and hypnosis." "In a nutshell, this effect can be done on stage, up close, informally, anytime, anywhere and is simply a miracle." "A new level of thinking. Great stuff." "It is magic in a performance/motivational sense, yet magic also in the ancient idea of using 'illusion to create truth' - one of our mottos. The cover of the book is a powerful spell..."
"Actual wit and intelligence wrapped up in a lovingly and artfully prepared book... A wonderfully structured and thought-through routine, described with humor and style. KEEP UP THE GOOD WORK!" "A unique concept, also helpful to people who are trying to change harmful habits." "What a great thinking! Definitely a different book, recommended to the real worker." "A very thorough, well thought-out approach. Absolutely nothing has been left out. Well done!!" "Stop-Smoking Mentalism is one of the best books ever written on mentalism and, dare I add, magic. 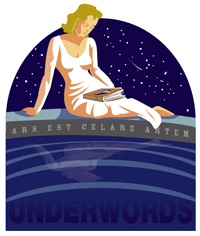 There is the old question: if you were lost on a desert island and only had one book what would it be? Personally I think this would be a hard book to beat. " "I find it both fascinating and wonderful." 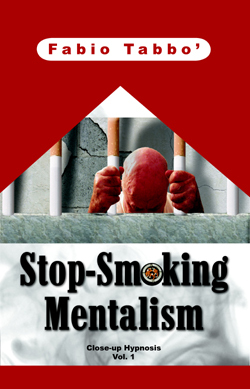 "Stop Smoking Mentalism is certainly a unique book, where you can't fail to be stunned, beyond the presented effects, by the author's preparation and care in the research and study of the elected topic. A volume that will surely be cherished by mentalism fans, but that should also be read by everyone else to understand, learn and personalize the method of analysis and the creative process." Underwords is extremely proud to present the first installment of the Close-up Hypnosis series, a new collection of exclusive hypnotism and mentalism effects, achievable in real-world impromptu situations. At last, a serious answer to the "Can you hypnotize?" request: professional performance pieces presentable in real close-up settings, without any assistants, props, preparation or stage requirements. There seems little doubt that, once mastered, this piece will provide a convincing "YES!" in response to the question "Can you hypnotize?" A hypnotic convincer that will delight and baffle even the most drunken audiences. A fantastic routine... This is an outstanding start. Effect: A spectator is asked to participate in an experiment of stop-smoking hypnosis. She pretends to smoke an imaginary cigarette, and feels as if a real one was being used: she vividly visualizes its gray smoke, smells and tastes the tobacco, feels like coughing, etc... She then brings this invisible cigarette closer to her hand, causing a noticeable warming sensation; and when she finally decides to stub it out on her hand, she feels a sharp burn! You can present the effect under any conditions: it seems completely impromptu and gimmickless, with the performer away at all times. The sheer depth of thought that has gone into this presentation sets a new standard in magical writing. The most detailed analysis we have ever seen. A bible of knowledge... An absolute gem. No pre-show, no prepping of spectators, no warm-up round (the effect can be used as an opener), no advance work, no preparation of the physical environment, no assistants, obviously no stooges (not even instant stooges); the effect can be presented on the spot for an audience of complete strangers, in virtually any conditions, from intimate performances in your friend's living room to full stage shows. The participant is in full view at all times, and is never touched by anybody. No marks, no traces left. You start clean and end clean, with hands shown empty before, during and after the effect. No jacket or long sleeves required. No long scripts to memorize, no cheat sheets, no prompters, no convoluted plots. No real cigarette is ever lighted: the effect can be performed in non-smoking environments. A non-smokers version is also included. A phenomenal work… More than just an incredibly effective trick and a staggeringly good effect, this a doctoral thesis on performing. “Stop-Smoking Mentalism” isn't just a keeper for anyone wanting a powerful demonstration of hypnotic ability; it's a requirement for anyone performing in front of living, breathing people. Tons of techniques drawn from the fields of mentalism, hypnosis, magic, psychology, linguistics and NLP have been thoroughly explained and - more importantly - applied to the effect: from adjunctive suggestions to embedded commands, from secret gimmicks to misremembering (an entire chapter called "Thirteen Steps to Misremembering" is devoted to the subject), everything has been included. Independently from your current level of skill or knowledge, this detailed approach will allow you to learn faster and save years of study and experimentation, maximizing the potential of your presentations and making the difference between good effects and MEMORABLE experiences for your audience. This practical method, coupled with a masterfully-crafted script honed over thousands of performances, will allow you to deliver a fast-paced, audience-centered and "surefire" routine of killer hypnotism. Read FAQ! A fascinating book, between hypnotism and cigarettes. A complete magic act, and an outstanding lesson in spectators' management. This is a book every magician should read. I’m sure you’ve all heard that you should be prepared for all possibilities in every trick you perform, but how many of you have actually done it? I really mean ALL possibilities. If you want to really understand what this means, and you want an example of this amount of preparation, you really need to read this book. This is truly a case where every move, every word, every gesture, every movement, is well-thought out, analyzed, and fully described. If you’ve ever wondered how to improve what you already do, or how to improve your stage presence and performance, this book is a must reading. Please click on the "Buy Now" button to be transferred to the secure site, and make sure to return to the Underwords page after the payment (by following the relevant link) to claim your free Ebooks!